Introduction: The dating of castle masonry is always a hazardous business. In the case of White Castle the surviving evidence appears quite clear as to when major building work took place in the thirteenth century. This is interesting in itself as it shows that the round towers and gatehouse of the fortress are part of the early twin-towered gatehouses that graced Britain in the first third of the thirteenth century – the re-dating of the inner gatehouse at Pevensey castle being a good case in point. To investigate White Castle thoroughly it has been necessary to look at all three castles of the Trilateral and their history. Here the salient points are reiterated to show the most likely conclusion that the main masonry works at White Castle date to the time period 1229-1231 and 1234-1239. For those who want to know the full references for the facts and figures displayed here they need to refer to my works on all three castles of the Trilateral. The first thing to be done is to examine the history of the site, also known as Llantilio castle, from 1219 to the end of the century by which time most of the refurbishment of the castle would have been completed. During the period 1219 to 1232 the castle was held by the justiciar, Hubert Burgh (bef. 1180-1243). His important career has been much studied and it is certain that from the time of King John (1199-1216) affairs of state must have taken up much of his time. However the demarcation between government and private business was not clear-cut in this era. In August 1220 the government came to Skenfrith and there is substantial circumstantial evidence that this castle was massively rebuilt between then and 1224. Between 1224 and 1227 it was the turn of Grosmont castle to have major stone additions to its defences. By 1227 the Constable’s gate at Dover castle, one of Hubert’s major projects, was complete and the building of the FitzWilliam Gate there was well under way. Finally in the period 1229 to 1232 and 1234 to 1239 the circumstantial evidence suggests that the defences of Llantilio (White) and Hadleigh castles were overhauled as Hubert Burgh’s final military building projects. During 1229 Hubert visited the Trilateral, the king authorising the expenditure of 1s 6d for the cost of a messenger ‘going to the king’s justice at Skenfrith’. 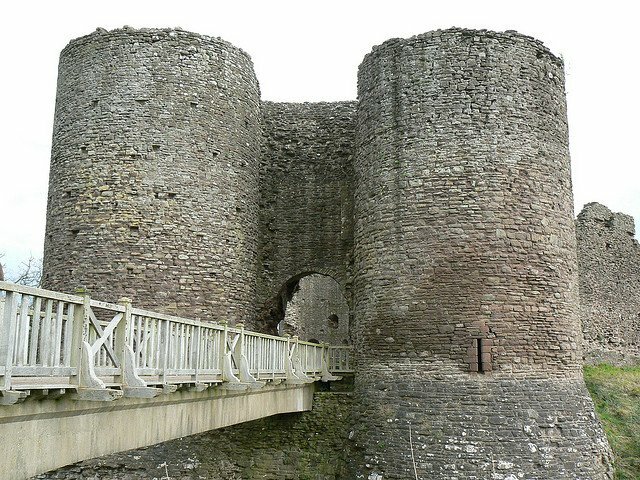 Although this suggests that Hubert was residing at the most hospitable of his three Gwent castles, it is also possible that Hubert was here to oversee the initiation of the refurbishment of the defences of White Castle, which would appear to have started about this time. A year after the possible commencement of the new works at White Castle, on 20 November 1230, Hubert was granted ceremonial permission to construct a castle at Hadleigh in Essex. It would therefore be most surprising if Hubert was to upgrade the defences of only three of his four main castles. It is even more surprising to accept this when a contemporary chronicle specifically states that Hubert spent a fortune on all four of these castles and not just on three of them.